Once upon a time, I made some beautiful pink tulle lights. They were extremely popular and people asked for the tutorial So I made a second strand, this time using black tulle, and posted the tutorial on our blog. My intention was to make spooky lights, but I was shocked at how gorgeous they were. So I am using them again for New Years Eve decor! Need some other simple (and CHEAP!) decor ideas? I have a few for you! Have a bar area that needs to be dressed up? 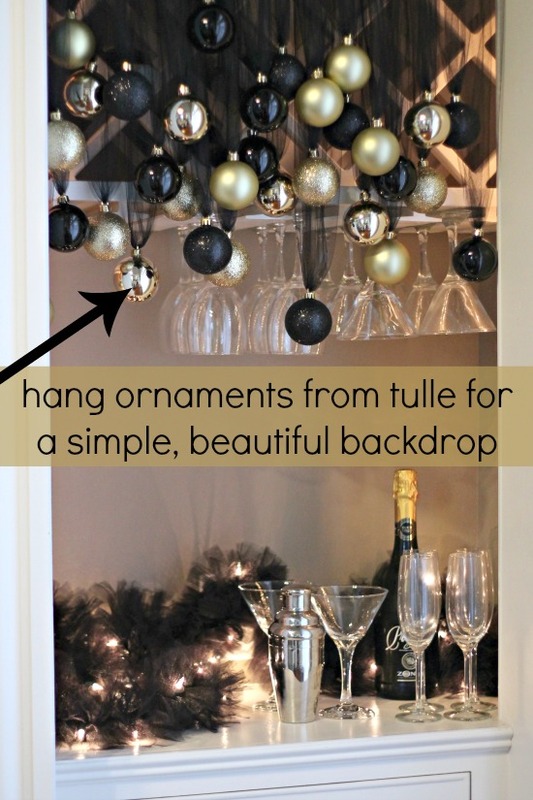 Hang ornaments from tulle as a back drop. I happened to have a built-in bar to work with, so I was able to hang them on a suspension rod. But you can get creative. Hang a cluster from one hook. 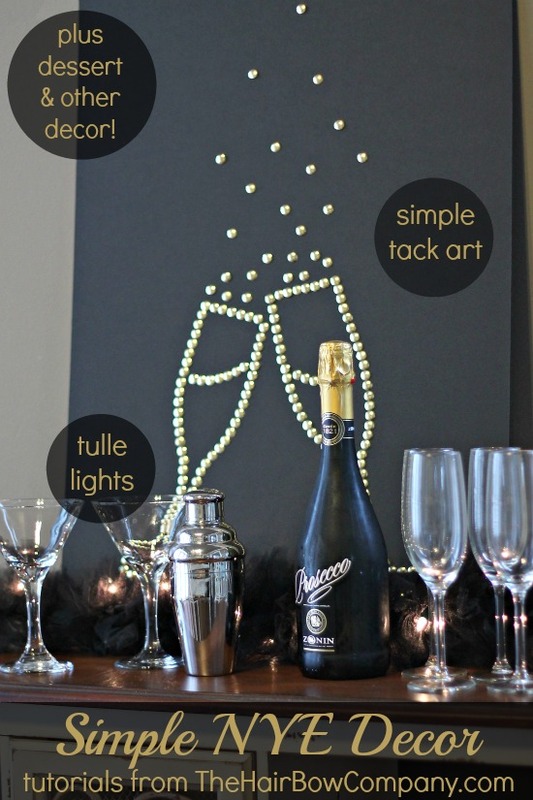 Hang a long strand of tulle across your wall from two tacks, and then hang them from that. Tie them to an actual curtain rod. These would look beautiful anywhere! 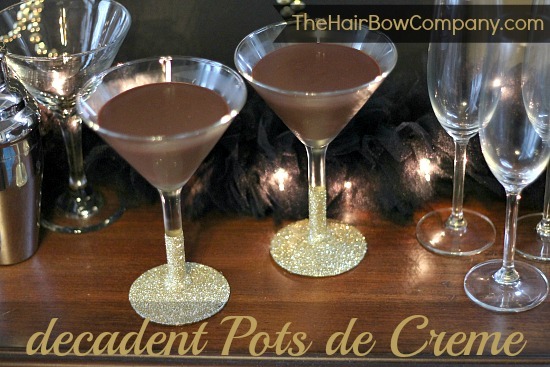 If you're serving dessert at your party, this Pot de Creme is to die for! Seriously. Hang on to this recipe and make it for Valentine's Day... and your birthday... and Saturday. Put chocolate and salt in a large bowl. Combine cream, sugar, and vanilla in a saucepan over medium heat. Stir constantly. Just as it reaches a simmer, pour it over the chocolate. Let it sit for a minute to melt the chocolate, then whisk until it is smooth and shiny. Pour into glasses or ramekins and refrigerate until cold and set, about 4 hours. Okay, don't leave yet. This is my favorite part. This craft is fool proof and gorgeous... my specialty. 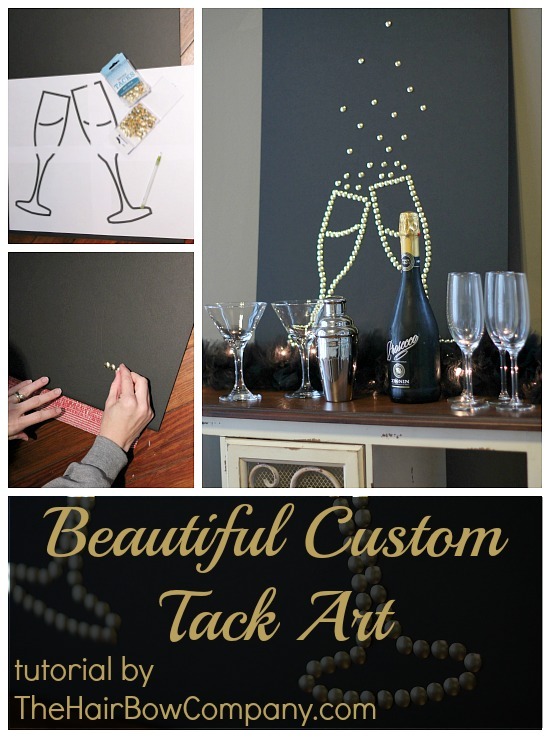 Tack art. Easy peasy. All you need is a foam board, tacks, a pencil, and your creativity (or a printout or someone else's creativity). I enlarged a photo of some champagne glasses and printed them out. If you are even slightly creative, you can come up with your own design. Trace your design on to your foam board. You don't need to see any ink on the foam board, you basically just need to trace it so that there is an indent in the shape of your design. Then just start pushing the tacks in along the indent. It takes a couple tries to get the hang of it. You can pull the tacks out and try again if one is too close or too far from another. Nobody will ever know! I'll also add that I laid my foam board on a rug. The tacks were slightly longer than the thickness of my foam. So opt for a thicker foam, or just be careful not to scratch your table. And if you plan to hang it, don't scratch your wall! I just propped mine up on a buffet, so none of my tacks came close to touching the wall. Have fun crafting and enjoying your New Years! We look forward to lots of tutorials, recipes, and party planning ideas in 2015! !